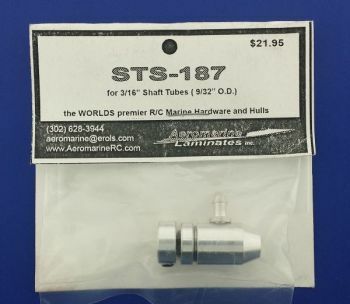 Shaft Tube Seal(STS) for .187 flex cable with 1/4" stuffing tube. Design by Aeromarine. Aeromarine has always striven to bring you the latest in innovative R/C Marine products. The NEW STS is no exception. The explosion of today's new electric setups have sparked its own set of obstacles to overcome. Hulls need to be virtually hermetically sealed to prevent damage to expensive electronic components. Even the most seasoned builders have trouble with the elusive sealing of the stuffing box tube. Not anymore! Extensive trial and error testing lead the way to our NEW Patent Pending STS (Shaft Tube Seals) design. Compact and made of the BEST materials and bearings available. Install this fitting on the end of your stuffing box tube, the precision collar on the shaft, and your tube is sealed from any water entering the hull. Grease fitting incorporated allows for easily greasing the shaft between runs. High Speed Bearings allows for a friction-less seal. One try and you'll have ALL your hulls outfitted. Great for nitro too. 1/4" (.250") (6.35mm) OD stuffing tube diameter.